People promise to change every day for so many reasons. You know by their actions. The words poured out. The promises flowed. But along with the words and promises came action. Turning to God in the face of death is not exactly unheard of. In fact, people turn to God in the face of bad circumstances all the time. But often times our promises are empty and true change never comes. But that’s not the case with Travis. Having known Travis for many years and having had many theological, political, and moral debates with him over the years, I admit, I was skeptical in the beginning. In fact, I was so taken aback by his sudden and dramatic change I remember asking him, in those beginning weeks, if he thought it would “stick”. I wondered if once he got back into a bit of a routine and around his friends if the promises would…fade. Words can fade…actions leave an imprint. You can fake words. You can’t fake actions. Ok. Maybe you can fake some actions. You can certainly clean up your language. Head to church every week. Even sit down to have the occasional quiet time. But that’s not the kind of actions I am speaking of. I know Travis has changed because of his actions. This all started with eight tumors just eleven short months ago. The CT scan also showed that his large tumor went from 4.1 cm to 5.5 cm…in just three weeks. This disease is out of control. As you can imagine, sadness has taken over the Roberts family in these past few days. A sadness most of us could never relate to. One the Roberts hope you never have to relate to. A sadness so deep and raw that sobs can burst forth out of nowhere one minute and crying seems impossible the next because of the numbness. What’s left? Not much. In the pharmacist’s words…”at this point it’s just moving chairs on the Titanic”. But there is one more glimmer of hope as far as modern medicine is concerned. Another trial. This trial uses Travis’ own immune system to fight his cancer. It involves a trip to Washington D.C., for one month, away from his family, friends and support system. It involves a pretty risky surgery removing part of his tumor to basically create white blood cells that will, in turn, fight his cancer. It involves the mother of all chemo treatments…sickness so bad it will be done inpatient. And…once the white blood cells are created they will inject them back into his body to fight the cancer. There are a lot of hurdles to overcome for Travis to make it into the trial. First…he has to be accepted into the trial. His records are being reviewed this week or next to determine acceptance. Second…he has to be off chemo for one month before they can do the trial. Somehow, despite the recent rapid growth, the cancer cannot go rampant in his body, taking over his liver or other organs, in order to remain eligible for the trial. And, third, despite having 15 tumors in his liver, Travis’ liver counts are all well within the healthy range. They have to stay there until he gets his surgery…assuming he is accepted…assuming the cancer does not take over. But not too tall for our God. How do I know Travis has changed? Because despite this news a few days ago. Despite having a rash so painful from the chemo that doesn’t even work that narcotic painkillers won’t touch it. And despite having a sadness so deep and raw…Travis showed up at church Sunday with nine visitors. Happy to be there. Because he loves deeper than he ever has before. A love so deep it can actually bring about sadness. A sadness that comes with facing the possibility of leaving your wife and babies. And because he has done what so many of us can’t do for even the pettiest of reasons. He has extended forgiveness. Even for…the unforgivable. And finally, because just a few weeks ago, he took the boldest action a Christian can take. Travis was baptized. An outward action of his inward change. And, what’s sweeter, two of his friends were baptized right after him. Two friends he would have never met, let alone befriended, had he not had to walk this nasty road called Cholangiocarcinoma. A year ago, it was unlikely you would have found Travis at a church…let alone inviting others to come, or being baptized for that matter, had he not had to walk this nasty road called Cholangiocarcinoma. Sunday, at church, a song came on that either I have not heard before or I just haven’t paid much attention to. The words hit me. Hard. Tears streamed down my cheeks and chills ran down my spine as I listened to the words and thought of my friends. Their trust is without borders. Their faith is stronger. In the presence of their Savior. I know it by their actions. This entry was posted on Sunday, March 9th, 2014 at 6:50 pm	and posted in Uncategorized. You can follow any responses to this entry through the RSS 2.0 feed. 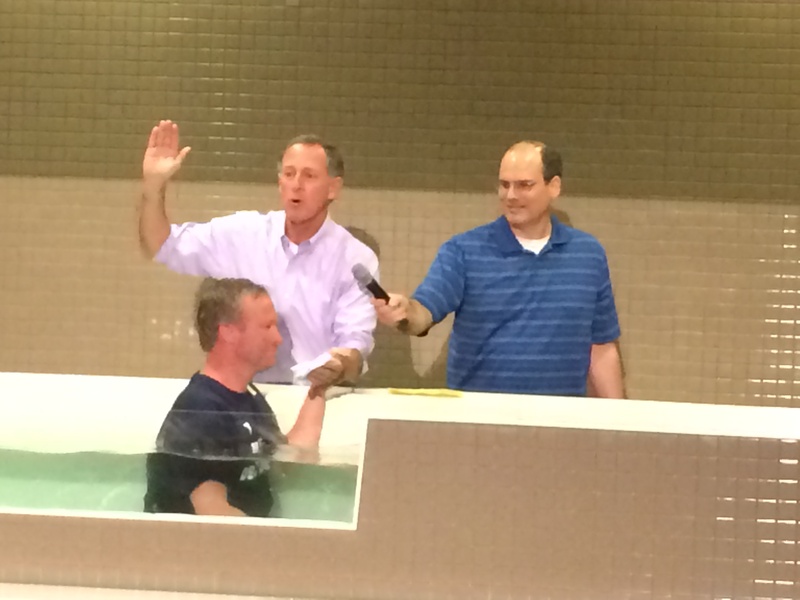 Travis, praising God for your baptism – what a great step of obedience to Christ’s command that we follow Him. I pray for strength in your spirit as you fight this battle. Do not lose hope in our great Savior to be all that you and your precious family need Him to be for you in this journey, and I ask Him to give you strength as each day requires. You are righteous because the blood of Jesus Christ has paid the price for your sin and declared you to be righteous. His name is strong tower for you and your family, and you are all safe there – even in the darkest night. how you do it, but you should write a guide. Your words and actions always inspire, the way you do it, I truly admire. When I look at you, I’m very proud to call you my friend, and not afraid to proclaim aloud. Every challenge that you face, you manage it, with so much grace. This strength of yours often amazes me. I know you deserve more than just praises. With all you do deserve so much more, but we don’t know what God has in store. I want you and Carrie both to know, that I support you one hundred percent. One-hundred and fifty, is what I actually meant. I’m here for you, whenever you need, your expectations I hope to exceed. Tomorrow is something, together we’ll deal, if pain follows us, together we’ll heal. The actual process may be quite slow, through this journey, together we’ll grow. In the end, the challenges we face, we won’t run away, instead we shall chase. Whatever happens, I know you will win, for I will be with you until the end. I love you both and it was an honor for both Kelvin and I to be baptized with you. You have changed our lives in ways you’ll never know. Travis and Carrie, I’ve only known about your story a short time when you shared it with us at Northwestern Mutual in Atlanta. The impact your story has had on my life will be one that is strong and stay with me for the rest of my life. I thank you so much for your courage, strength and belief. Stay strong my friends, be concrete in your faith. Praying! Many lives are being touched by your family! God is being glorified! Through your trials many are finding their Savior. As the post mentions not the path you would have chosen but it is the path God has chosen for you today. May you continue to find strength in the Almighty! As I read your blog tHe’stears was streaming down my face. I know I’m always saying you have a testimonial so I dried those tears and ask myself what would I tell you if you were crying. Travis without the tears here goes. Yes you still have that test to go through because I want that testimonial. You and Carrie are the most wonderful people I know. Travis you are an amazing friend, husband, father, entertainer and loved young man. I’m glad I know you, not a day when you come in you still have that same sense of humor. It was a pleasure meeting little Travis(Trey). Boy the way his eyes lite up speaking about what him and his dad was going to do really put a smile on my face. You’re his hero if you didn’t know. God has not giving up on you, so continue to put Him first and watch what he will continue to do. We don’t know why God loves us the way He do but He does. He’s a God of many hats. He won’t put no more on you than you can handled. Travis you have been handling something, but you didn’t and you not giving up. Carrie you also continue to be strong. I know easy for me to say but you are a braved person, mother, wife, friend and many more. You are a true example of standing with you man(husband). Love is what I call it. You have been and are amazing. Travis you are truly blessed to have a woman(your wife) to stand with you. Thank you Jesus for watching over this family in the misted of all their trials and tribulations. Continue to heal Travis mind and body. Lord, I know you can. You haven’t failed them this far. God he can’t do this without you. Please Lord show up and show out. In Jesus name thank you. Travis, He’s an on time God, yes He is. He’s an on time God, yes He is. He may not come when we want him but He be right there right on time. Cause He’s an on time God, yes He is. I do not remember how I found your blog. I am not one to “blog search”. I am a nurse by trade and perhaps that is what captured me to your diary of this journey of faith, love and deep pain. I have been away for awhile and just saw your link and sat down to peer from afar your ongoing courage and strength as it has been forced upon your lives. I feel helpless and as I am sure so many of us want to feel that we can be a tool for you both. Which brings me to this moment. Your honesty, fearlessness, fear, love and faith are true and solid blocks of strength that will hold you in joy and sorrow. Your journey is special. I know you do not want that,but one can only swallow this very unwelcome pill and make this moment a true symbol of who and what and where this fate means to this unity that you have with each other, your children, family, friends and god. I do not pray too much. But, you have changed that for me. So maybe I am a tool for you. I hope there is strength in numbers because you can add me to the list.